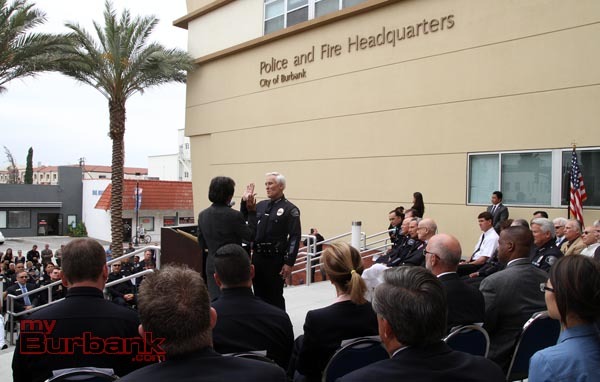 Burbank’s Police Chief, Scott LaChasse, was officially sworn in today in ceremonies held on the steps of the Burbank Police and Fire Headquarters. 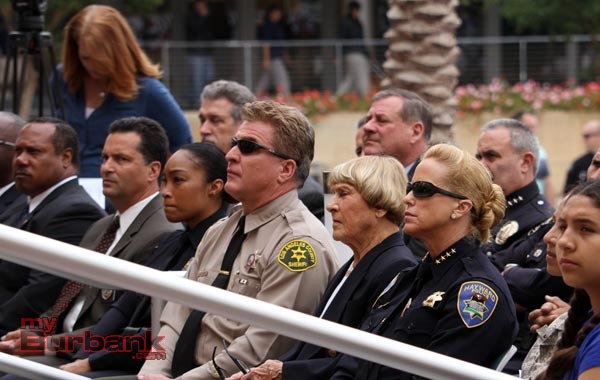 Los Angeles County District Attorney Jackie Lacey administered the oath. Chief LaChasse has headed the department since January 2010, when he was hired as Interim Police Chief. 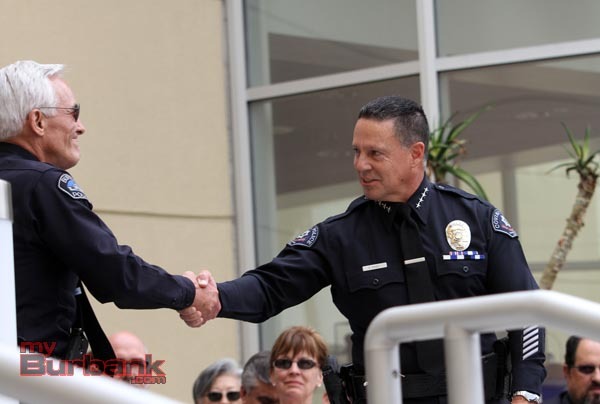 Burbank’s Interim City Manager, Ken Pulskamp, made LaChasse the permanent chief in April. The official swearing in ceremony was planned for today so that LaChasse’s son, Dan, an F-18 pilot in the United States Marine Corps, could attend. Unfortunately, according to the Chief, his son was in Arizona for advanced weapons training and could not make the ceremony. And a grand ceremony it was. Chiefs of Police from more than two dozen departments in Southern California were present, as well as Assistant and Deputy Chiefs of Police from a number of agencies, including the California Highway Patrol, FBI, ATF, U.S. Marshall’s,Former Burbank Lt., Rick Madrid who now works at Paramount Pictures, and others were in attendance. Also in attendance was LaChasse’s 89 year-old mother, and his brother, who is with the Los Angeles Sheriff’s Department. 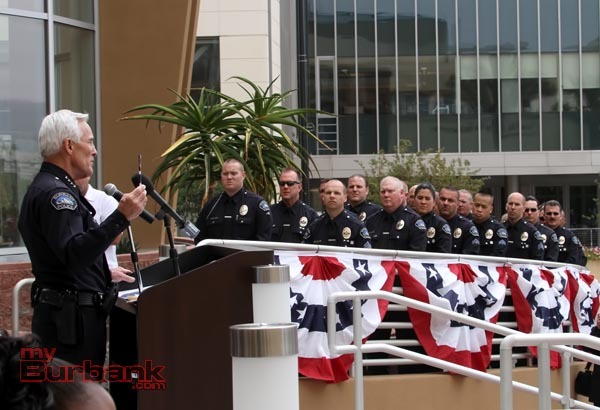 Long Beach Police Chief Jim McDonnell, who is also president of the Los Angeles County Police Chiefs’ Association representing the 46 chiefs in Los Angeles County spoke about working with LaChasse when both were with the Los Angeles Police Department. McDonnell was a homicide detective in the 77th Division in South Central Los Angeles back in 1987, and then Captain LaChasse was his boss. He spoke about the high regard those in law enforcement have for Scott LaChasse both professionally and personally, noting the cooperation and collaboration between departments that LaChasse has pursued. Other officials who spoke included Burbank Mayor Emily Gabel-Luddy, and Chamber of Commerce President and CEO Gary Olson. All five members of the City Council were in attendance at the ceremony, along with the city manager, and many department heads. The Rev. Dr. Wayne Walters of the First United Methodist Church gave the invocation, followed by the Pledge of Allegiance led by Aracely Jimenez of the U.S. Army. 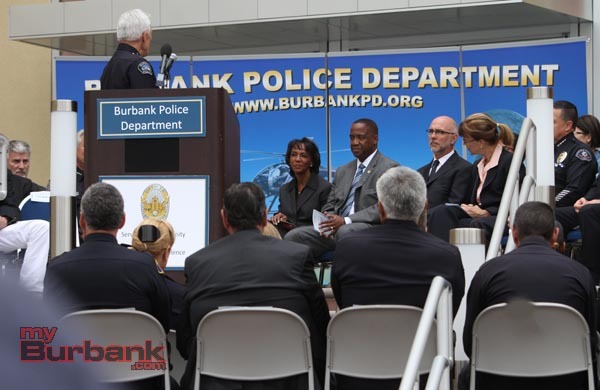 Burbank Police Officer Kiyomi Scott sang the National Anthem. James Ellroy served as master of ceremonies for the ceremony. In addition to being a noted author, Ellroy is also a long-time personal friend of LaChasse. He was given the task of introducing all of the dignitaries in attendance, a list numbering well over 50 people. 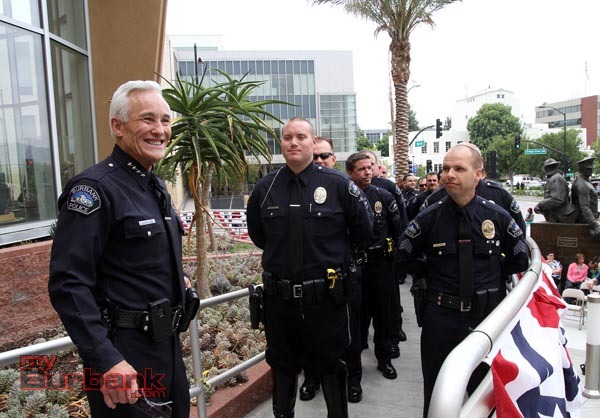 Chief McDonnell joked that Ellroy had been given the reserved parking list by mistake. 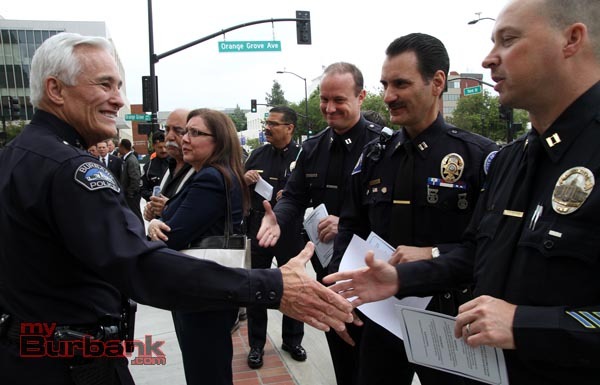 On a more serious note, Chief LaChasse spoke about his career in law enforcement that began in 1970 with the LAPD. He retired from that department as a Deputy Chief after 32 years on the force. He is a strong advocate for police engaging in a partnership with the community. 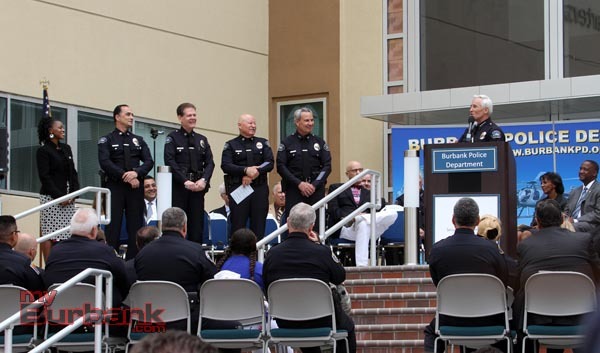 Towards that goal was the recent formation of the Burbank Police Foundation. 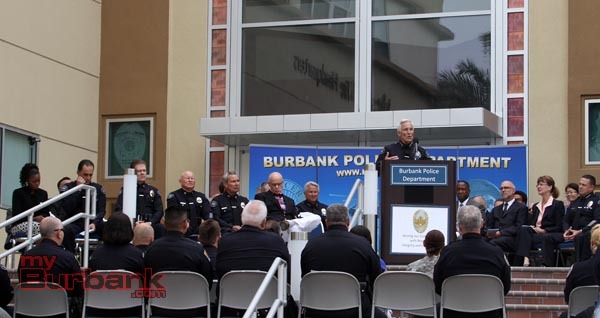 Commenting on the talent and education of the men and women who make up the Burbank Police Department, LaChasse noted the “commitment to continuous improvement” that exists in the department. He also had high praise for his command team. Holding up a small booklet, LaChasse noted that it was a copy of the Constitution and the Police Officers’ Code of Conduct. “Everyone who comes on this department gets a copy,” he noted. 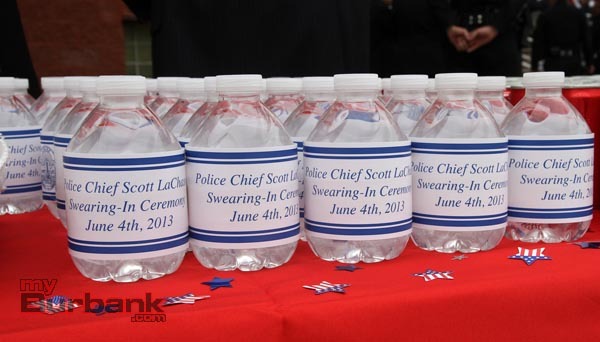 The ceremony was followed by a reception in front of the police station. Third Street and Orange Grove Avenue were closed to traffic during the event to accommodate the crowd. 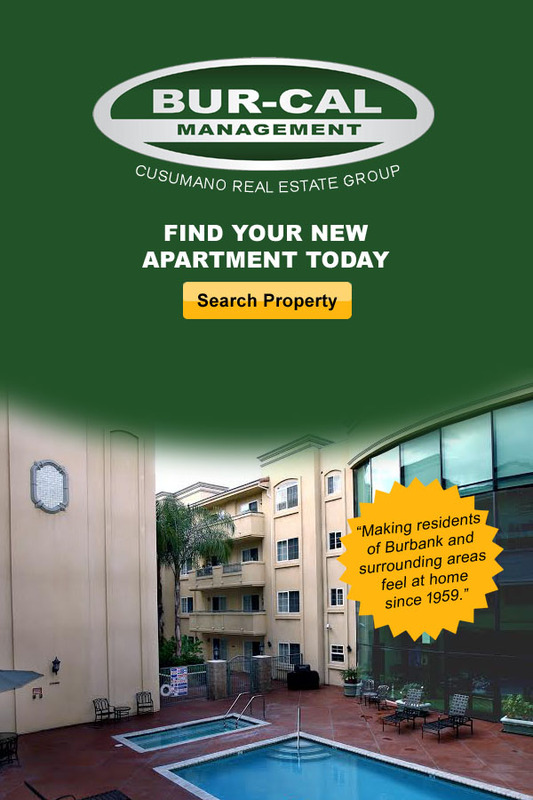 This entry was posted in Events, Featured, News, Police and tagged Burbank Police, Scott LaChasse on June 4, 2013 by Stan Lynch.